Chinese New Year of 2017, THE YEAR OF THE Dog … It will not just be fifteen days of festivity, but it will be a time to strengthen the bond of love and respect. It will mean reunion, feasting, revelry and parties for Chinese people. Dinners will be organized by Chinese families and will be a great get-together to come close with family, friends and dear ones. Delicious and delectable gastronomical delights will be cooked at home like chicken, fish, and cakes so that New Year will usher in happiness, wealth and good health. What is the LANTERN FESTIVAL of Chinese New Year? The Chinese New Year ends with the Lantern Festival on the fifteenth day of the celebration. Some of the lanterns may be works of art, painted with birds, animals, flowers, zodiac signs, and scenes from legend and history. People hang glowing lanterns in temples, and carry lanterns to an evening parade under the light of the full moon. •Fold a rectangular piece of paper in half, making a long, thin rectangle. •Make about a dozen or more cuts along the fold line. Don’t cut all the way to the edge of the paper. •Unfold the paper. Glue or staple the short edges of the paper together. •Cut a strip of paper 6 inches long and 1/2 inch wide. 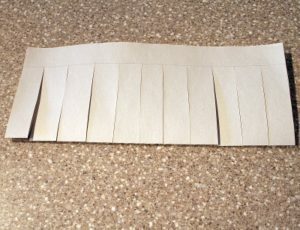 Glue or staple this strip of paper across one end of the lantern – this will be the handle of the lantern. Have the children put on their own Chinese New Year PARADE and SING songs to celebrate. In many areas the highlight of the Lantern Festival is the DRAGON DANCE. The Dragon—which might stretch a hundred feet long—is typically made of silk, paper, and bamboo. Traditionally the dragon is held aloft by young men who dance as they guide the colorful beast through the streets. Make your dragon with an extremely long sheet of roll paper and have children hold each end for your parade. Many cities hold parades which are lead by a huge dragon or lion. The Chinese have a great belief and respect towards dragons and believe the dragon is the symbol for good luck. In the Chinese legend the dragon is not a monster but a protector against evil spirits. He is the symbol of luck, goodness and strength. The lion is the symbol for protection and is thought to guard against danger. Children enjoy watching and joining in with the parade and take part in the great Dragon Dance. FYI: In the United States, where the Chinese New Year is celebrated with a shortened schedule, the ‘Dragon Dance’ always takes place on a weekend. In addition, many Chinese-American communities have added American parade elements such as marching bands and floats. At Chinese New Year celebrations people wear red clothes, decorate with poems on red paper, and give children “lucky money” in red envelopes. Wear Red… and write poems and decorate them in red! Red symbolizes fire, which according to legend can drive away bad luck. The fireworks that shower the festivities are rooted in a similar ancient custom. Long ago, people in China lit bamboo stalks, believing that the crackling flames would frighten evil spirits. •Create your own Chinese New Year FIREWORK PICTURE…The Chinese invented fireworks thousands of years ago! Work on old newspapers. Spread glue on the paper in geometric shapes. If the glue is soft enough, you can put a small blob of glue on the paper, and then blow some air through a straw to spread it into interesting shapes. You can experiment with the consistency of the glue and the angle of the straw. Sprinkle glitter onto the glue. Slide the excess glitter off your picture and back into the glitter container. •PLAN A CHINESE RIBBON DANCE: Although Chinese Ribbon Dance sticks have wide and very long ribbons–make a more simple version. Idea #1: Attach crepe paper streamer or ribbons to a chopstick or pencil. Play Chinese inspired music and have children MOVE WITH THE TWIRLERS…. Show a movement with the ribbon and have children copy it. 1. Wrap ribbon around the paper towel tube, applying tacky glue under the ribbon as you work. You can wrap the ribbon at an angle or horizontally, whatever you prefer. 2. After ribbon is applied and glue has dried, punch 9 holes in the bottom of the paper towel tube with the hole punch. 3. Cut 12 strips of ribbon that are 46 inches long. • COLLAPSILBLE UMBRELLA are all Chinese inventions?! Celebrate by playing dominoes, making/flying a kite, and making some fireworks art! 1. Have the children draw a design (or make one with tissue paper) on the paper plate. 2. Next have them glue foot long streamers on the paper plate. 3. Last, punch a hole at the nose of the plate— and tie a piece of yarn through it. 4. Wrap additional yarn around a craft stick and then tape the yarn on the plate to the stick. The kite will really fly on a windy day. • Cut out a small black triangle and glue onto nose. • Cut out two small white circles and glue onto eyes. •Fold ORIGAMI for a fun craft activity. Purchase colored paper and provide individual step-by-step instructions for the children to follow. Have different animal designs ranging in difficulty. BOOKS listed below TEACH CHILDEN ABOUT THE CHINESE NEW YEAR CELEBRATION and share information about the Chinese Culture in general—Great for elementary multicultural studies! •Invite a Chinese MARTIAL ARTS instructor to talk and demonstrate the philosophy and action of their skills. •Invite someone to teach children how to SAY AND WRITE THEIR NAME in Chinese and to discuss culture. •Play and discuss the MUSIC of China from ancient times to present day. 5-10 small objects like marshmallows, starburst candies or cotton balls. Place small objects like marshmallows, candies, or cotton balls in one bowl on a chair. Then place another empty bowl about 10 feet away on another chair. Players can only use their chopsticks to move the items from one bowl to the other. The first player (or team) to successfully move all objects from one bowl to the other wins. The children all form a line with their hands on the shoulders of the child in front. The first in line is the dragon’s head, the last in line is the dragon’s tail. The dragon’s head then tries to catch the tail by manoeuvring the line around so that he can tag the last player. All the players in the middle do their best to hinder the dragon’s head. Don’t let the line break! Any number of players, all ages, an ideal indoor game. Each player must have 5 sticks, which may be popsicle sticks, or plastic straws. To begin the game, all sticks are collected and piled into a confused heap. The player who can first remove one stick without disturbing any others, may continue, trying to dislodge other sticks using the first one, again, without disturbing the pile. If the pile is disturbed, the next player may try first to dislodge one stick, then others using the first stick. Any number of players, any age, played indoors and outdoors. This is a very simple game which combines the pleasure of marble-shooting and golf to create a unique game. This is also the most common form of marbles played in Europe and of course, in the Orient. If this game is played inside, circles may substitute for holes in the outdoors. A course consists usually of three holes, which may be three or four metres apart. (One meter is approximately three feet) Players begin at a starting line, and each flicks a marble with his fingers in classic marbles style, towards the first hole. Players count the number of flicks they take to sink their marbles. Players may knock others marbles away as well, somewhat like shuffleboard. At the end, the player with the fewest flicks is the winner. You need 21 toothpicks, beans or other small markers. Arrange the 21 toothpicks (or other objects) in a continuous, straight, horizontal line. Taking turns- each player picks up 1, 2, or 3 sticks at a time. • PLAY CHINESE CHECKERS AND CHINESE JUMP ROPE! • Package gift bag items for the children in Chinese food take-out boxes instead of traditional gift bags. SERVE CHINESE FOOD or finger food such as egg rolls and won tons. This will allow children to see what the Chinese like to eat—in comparison to something like American pizza or hot dogs. Add oil in a wok or frying pan over medium heat. Add cold rice after the oil is hot, continually stirring for about 3 minutes. Add frozen peas and carrots, soy sauce, teriyaki sauce and garlic powder; continue stirring until vegetables are tender about 10 minutes. Add cooked meat and stir for another 3-4 min or until meat is warmed through. Scramble an egg in a bowl; push all of the rice mixture to one side of the pan or wok– slowly add the egg to the empty space in the pan. Scramble until cooked through and then mix together with rest of rice mixture. •Offer CHOPSTICKS for the children to eat with. •MAKE FORTUNE CAKES– Bake cake in ice-cream cones with fortunes placed inside the batter of each cone. 1. Follow the directions to make your favorite cake mix. 3. Be careful not to fill them more than 3/4 full. 4. Put the filled cones into the cupcake tin. 5. Bake at 350F for 10-15 minutes. 6. Insert a toothpick to check that they are baked through. 7. Have kids frost and decorate their cupcake cones. • MAKE A DRAGON or SNAKE SHAPED CAKE … Pre-make cupcakes–frost them and place them in a shape of a dragon! Finish decorating as desired. You can also make a cake in a bundt pan (or two). Follow regualar baking instructions. When the cake is cooled and removed from the pan(s)–cut the cake in half. Place the two (or four) halves together (side by side) in a curvy shape. Frost and decorated as desired. • Make tea and have a Chines tea ceremoney. Click here to learn the history of the tea ceremony. Click here to read about tea drinking customs. Help children understand the Chinese Culture and embrace it. Many times, children believe that their way is the only way–at least until they begin to see the other ways things are done in different parts of the world. BOOKS ARE A GREAT WAY TO DO THIS! Make some PUPPY CHOW……Kids (grown-ups too) love this one! 1. Blend wet ingredients together. 2. Whisk dry ingredients together in a separate bowl, and then mix with wet mixture to form a ball of dough. 3. Roll out and shape as desired. Place on a non-stick cookie tray or lightly greased pan. 4. Bake twenty minutes at 400 degrees. 5. When finished, turn off oven and allow the biscuits to cool inside oven until crisp and hard. Instead of PIN THE TAIL ON THE DONKEY play Pin the tail on the Doggie! SING How Much is that Doggie in the Window?